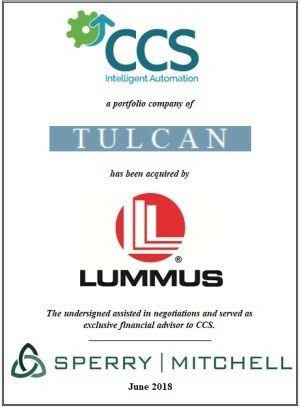 New York, NY (June 26, 2018) – Carter Control Systems (“CCS”) of Frederick, MD, a portfolio company of Tulcan of Houston, TX, has been acquired by Lummus Corporation of Savannah, GA, parent corporation of System Solutions of Kentucky (“SSK”) of Louisville, KY. Sperry, Mitchell & Company assisted in negotiations and served as exclusive financial advisor to CCS. Carter Control Systems (www.cartercontrols.com) is a leading provider of automated material handling and industrial automation solutions to customers across the U.S., serving an array of end-markets, including: postal, parcel, retail, food & beverage, and pharmaceutical. CCS provides a full range of equipment, controls and software, which helps customers address all aspects of their material handling and industrial automation needs, increasing efficiency to save companies time and money. Lummus Corporation (www.lummus.com), which dates to 1863, is the leading full-line supplier of machinery and replacement parts for the cotton ginning industry. System Solutions of Kentucky, an operating subsidiary of Lummus, is a single-source material handling systems integration company serving clients across North America. SSK is recognized for providing quality design, products, and high-touch services that allow customers to execute their logistics strategies. Tulcan (www.tulcan.com) is a private investment office specializing in growth equity and buyout investments in middle market companies. Tulcan invests in businesses with stable cash flows & successful management teams, focusing on investments in the process equipment manufacturing, heavy equipment, machining & metal fabrication, distribution, food processing, oilfield services, and chemical manufacturing markets.